Home Defects from Framing Errors- Armchair Builder :: Blog :: Build, renovate, & repair your own home. Save money as an owner builder. Home defects can turn an otherwise exciting process into a nightmare for unsuspecting customers. From warped roofing to squeaky floors, basic framing errors can lead to major frustration for homeowners. For those of you that are building a new home, we’ve created a simple checklist to help you verify the framing basics are completed correctly as your new home is built. 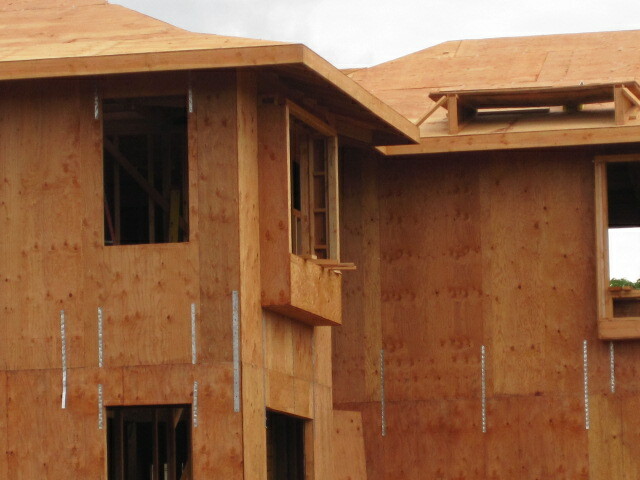 Structural support for your home typically comes from wood framing members. Floor joists, beams, and roof trusses all come together to create the structural shell of your new home. It’s extremely important to make sure these elements are installed without being notched or cut, except in rare circumstances that are allowed by the manufacture and/or by code. Improperly placed cuts, holes or notches in framing members can seriously degrade the integrity and can ultimately lead to failure and serious home defects. If your home has manufactured joists that have been cut, drilled or notched, be sure to check the manufacturer details explaining where cuts are allowed. For homes with standard dimensional joists, your will want to consult your local building code (or local building inspector). When it comes to roof trusses, absolutely no cutting is allowed. If a truss has been cut or drilled, you will need to have a truss repair detail created by your supplier. The joists for your home were designed to support the loads placed on them from above. This includes dead loads from things like flooring, furniture, and cabinets, and live loads from people and pets. The closer these joists are placed together, the sturdier the floor. It’s extremely important when building a home to space the floor joists per the manufacturer and code requirements. If the joists are supposed to be installed at twelve inches on center based on the span and size, then that’s exactly what they should be. Check the house plans for standard floor joists and manufacturer’s layout for manufactured joists to confirm the spacing is correct. Many of the beams used in new homes today are a manufactured product. Also called glulams, laminated beams are made from pieces of wood that are actually glued together. Oftentimes these beams can span greater distances and are a more stable product (in other words, shrink less) than dimension lumber cut from trees. One thing some builders forget is that these glulam beams have a top and a bottom. For the beams that do have a specific orientation, they typically come with a stamp that labels the “TOP” to alert the carpenters. These beams only perform properly if the camber, and edge labeled “TOP”, is facing up. 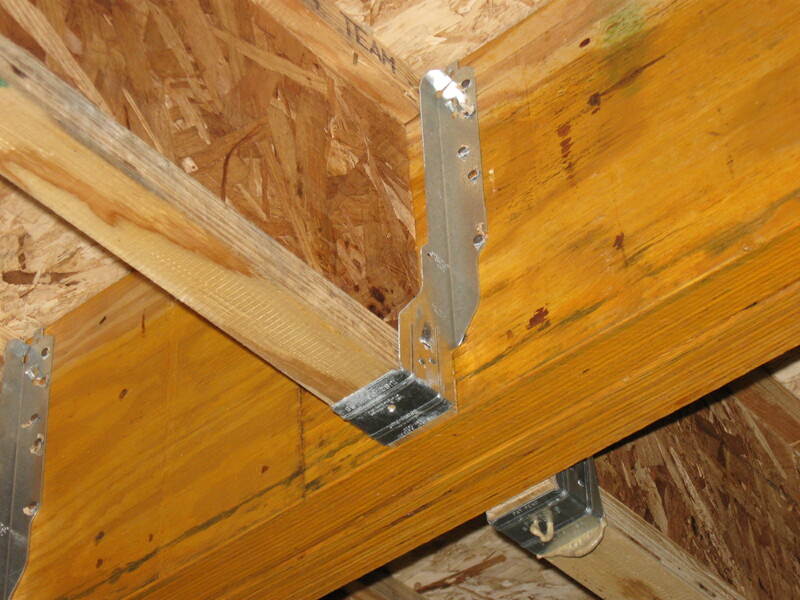 A glulam beam that is placed upside down can create settlement problems in your new home. These will sometimes show up as sticking windows or doors or cracked drywall. Whether they are trying to save money or just don’t estimate properly, some builders will skimp on the subfloor glue. Glue is used to secure the plywood or OSB (oriented strand board) to the tops of the floor joists. This provides a solid connection between the subfloor and the framing. When the glue goes on too light, floor squeaks can occur. By walking all of the subfloors in your new home prior to laying the finished flooring, you can identify problem areas so they can easily be fixed. Nails are supposed to be driven flush with the surface of all roof and wall sheathing panels. For those that are driven past this point, the structural holding power is diminished. Essentially, a nail that is over-driven is more easily pulled through the material it is holding in place. The part of the home that is most affected by this is wall and roof sheathing. During high winds, these connections become extremely important to keeping the structure intact. This is a home defect that probably won’t show up until mother nature unleashes some major wind on your home and by that time, it will be too late. So do a walk around of your new home as it’s being built and check that exterior wall sheathing nails are driven flush. Have you ever driven by a home and noticed seams showing up through the asphalt roof shingles? These seams or ridges show up when the roof sheathing (a.k.a. panels) swells and expands, creating a ridge at the edge of each piece. In order to avoid these ridges, the carpenter needs to leave a 1/8 inch gap between the sheets of plywood or OSB (oriented strand board) to allow for expansion of the material. This small gap is all that is needed to eliminate these home defects. By paying attention to these basics, you will be able to hold your framing contractor accountable. This should help keep your new home defects to a minimum. For a comprehensive framing checklist, check out the Armchair Builder, Builder’s Daily Construction Guide.